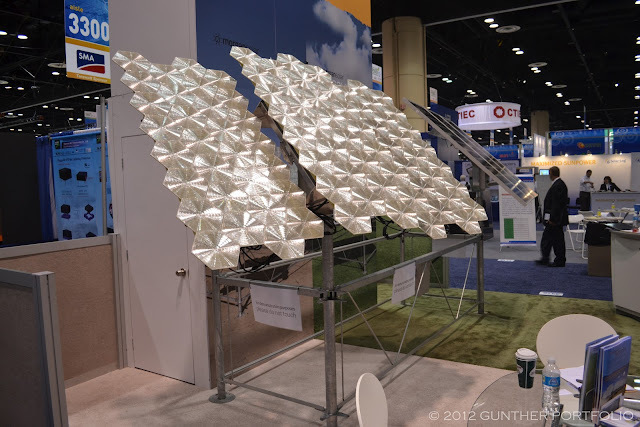 Select Photovoltaic News Tidbits from Solar Power International 2012 (SPI12). 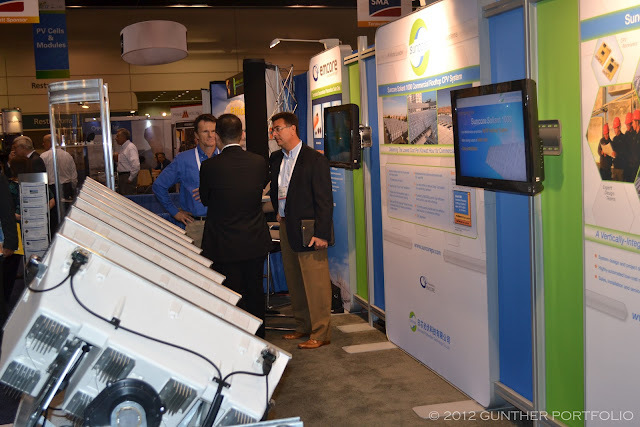 Before jumping into the Solar Power International 2012 tradeshow and conference metrics, here is a Picasa slideshow from the SPI12 Exhibition. 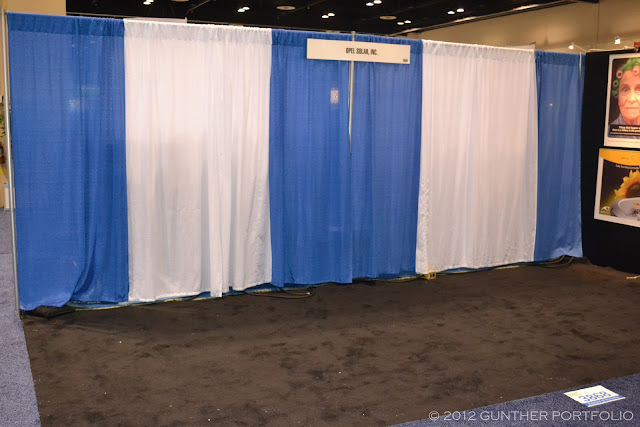 Per the pre-event press release “Tours of Solar Energy Facilities and Influx of First Time Exhibitors Heighten Attendee Interest at SPI ’12 in Orlando”, about 900 exhibitors were expected including almost 200 companies new to the SPI12 Exhibition. However, this represents a twenty five percent (25%) decrease from the record 1200 exhibitors last year at SPI11 in Dallas, Texas USA. The ongoing solar PV (photovoltaic) oversupply situation, industry consolidation, and the preliminary ruling against Chinese manufacturers in the US-China solar trade case can explain the decline in exhibitors. Among top brands, SunPower Corporation (NASDAQ:SPWR) and Kyocera Corporation (NYSE:KYO) were absent from the SPI show floor this year. I reckon at most one third of Hall C was used for exhibitors with some additional space dedicated to meeting rooms. First positioned on the western frontiers of Hall C, I heard Main Street Power Company, Inc. complained and got their stand location upgraded and moved to Hall A. Official SPI12 attendance figures have not yet been released although a decrease is expected from the total of 21000 industry attendees in Dallas. I struggled to get my feature post QBotix: Rise of the Solbots published the same morning the SPI12 exhibit halls opened. 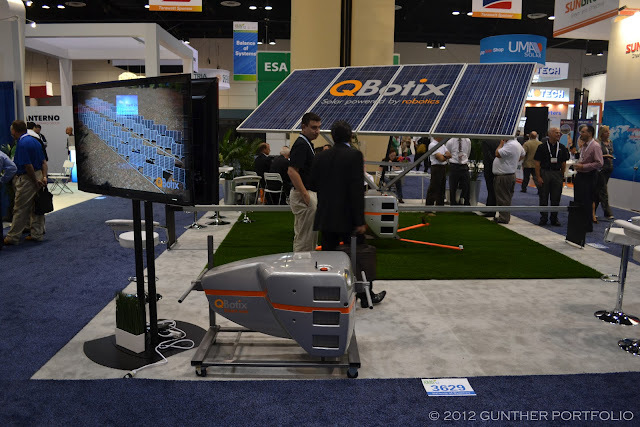 When asked what was new and novel at SPI12, QBotix was my first recommendation especially with a real solar robot and tracker demo at their stand. 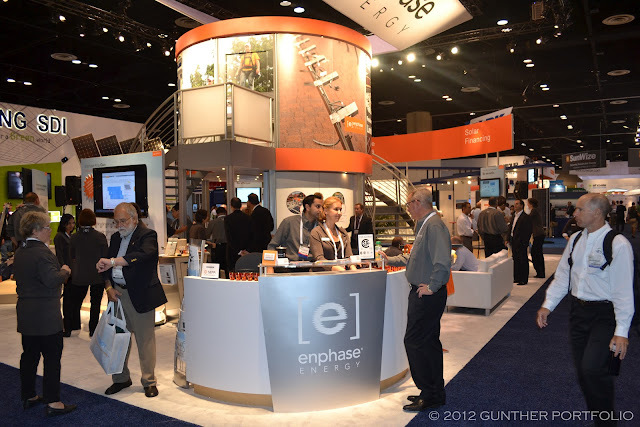 In stark contrast to SMA Solar Technology, Enphase continued to build upon their microinverter experience curve and loyal installer network with new installer tools, a new commercial solar initiative, and the Enphase Energized AC Solutions Marketplace. I checked out the ArrayGun barcode scanner and mobile app for syncing an installation array design to Enlighten monitoring software. ArrayGun is well suited for discrete microinverter installations but still requires clerical coordination for AC module installs. For unique insights into the premature SMA versus Enphase competition, please see “Solar Power International 2012 Recap” by Run on Sun Founder and CEO Jim Jenal. Just consolidated into the joint venture, Suncore Photovoltaic Technology Co., Ltd., the Commercial Rooftop CPV (Concentrating PhotoVoltaic) System made an encore appearance at SPI12. On the rooftop CPV system status at the Naval Air Weapons Station (NAWS) China Lake I covered in SunShot Grand Challenge: More US Department of Defense Photovoltaic Projects, Suncore told me 25 kW (kiloWatt) of the 500X concentration series have already been delivered and are pending a couple of items before installation, and the second 25 kW of 1000X product will be delivered by the end of February 2013. Suncore already installed a 2 MW (MegaWatt) CPV Demonstration Project outside their factory in Xiamen, Fujian, China, operational at the end of 2011. The system includes both CPV rooftop and ground systems but the breakdown is not provided. I wonder if the rooftop CPV system will still be called the Soliant 1000? “Opel Technologies Inc Agrees To Sell Solar Assets” was the news before SPI12, so I was not surprised to see the empty stand with the automatic tradeshow OPEL Solar, Inc. signage. I stopped covering OPEL because of the cagey responses I received regarding their High Concentration PhotoVoltaic (HCPV) deal with BETASOL posted in OPEL International asserts second BETASOL HCPV deal. 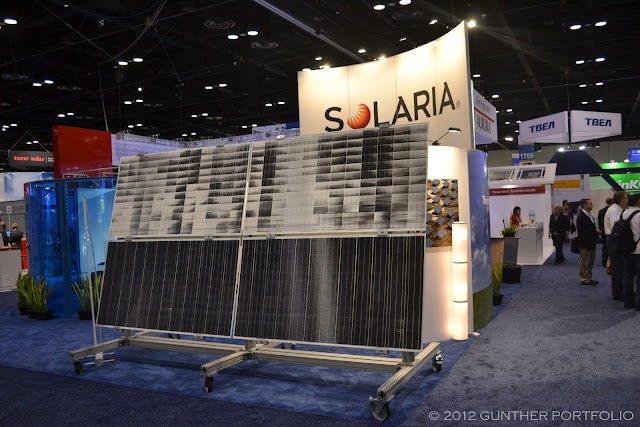 Morgan Solar launched the dual-axis Savanna Tracker product at SPI12. Morgan has opted to delay production of the current generation Sun Simba CPV module in favor of a redesign to address the PV market oversupply realities and drive towards the SunShot goal of $0.50 per Watt module costs. The Savanna tracker consists of a rectangular, self-ballasted box frame supporting a tracking armature at each corner. Frames mounted on each armature accommodate standard-sized Silicon PV solar panels. A field-proven drive train positions panels on-sun throughout the day within <2 degrees of precision, depending on wind speed. The Savanna drive train has been designed to require minimal maintenance over its lifetime. Savanna trackers are interconnected with pre-measured spacers, optimally arranging them for minimal shading and install time. A field of interconnected Savanna trackers together form a web, fixing each other in place and enabling operation in winds up to 35 mph. Targeting PV modules at first, Morgan emphasizes the Savanna Tracker’s pre-wired design, ease of installation with simple tools, and 25-40% increase in energy yield versus fixed tilt racking. 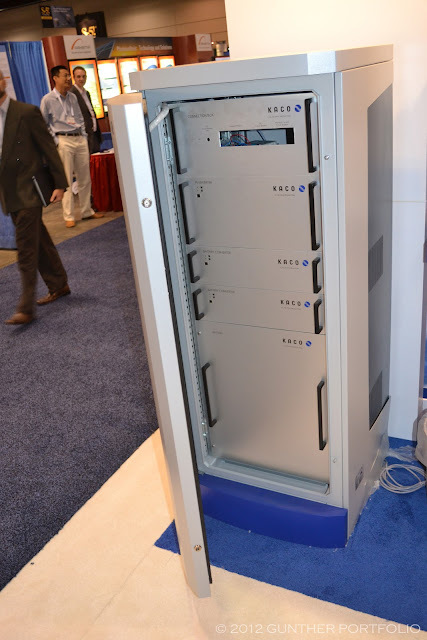 While Kaco was all ampt-ed up at SPI12, the Powador-gridsave energy storage and management system was most innovative. First displayed at Intersolar Europe, gridsave combines an inverter with lithium-ion batteries supplied by Panasonic and is still under development. According to the Kaco press release at pv magazine, up to five (5) 1.35 kWh (kilowatt-hour) lithium-ion battery modules can be configured in the gridsave for a total storage capacity of 6.75 kWh. The Powador-gridsave webpage and product brochure are only available in German (Deutsch) as far as I know. Solaria displayed a 280 Watt frameless module improving on the power rating by 5-10 Watts since SNEC earlier in the year. 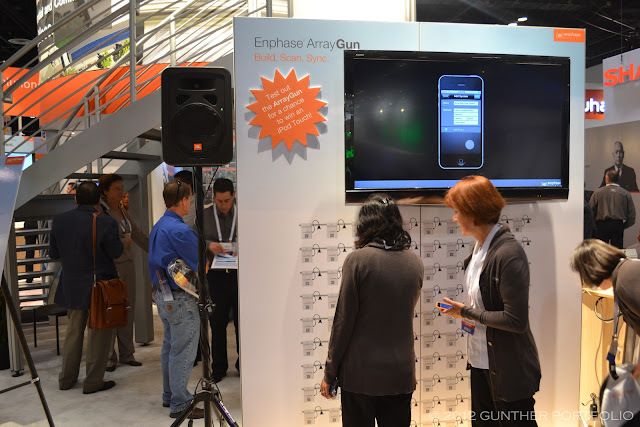 Solaria Chief Executive Officer (CEO) Dan Shugar presented at Intersolar North America 2012 but the presentation was not released in the conference proceedings. I have heard chatter about Solaria moving production offshore to India, but so far all the modules I have seen are marked Made in the USA. PHOTON – The Photovoltaic Magazine 2012 Issue 09 teases with the cover feature, “ROADKILL: Just making it to Solar Power International is a victory for thin-film”. By that metric, thin film manufacturers SoloPower, Inc. and TSMC Solar Limited, a subsidiary of Taiwan Semiconductor Mfg. Co. Ltd. (NYSE:TSM), both notched victories. SoloPower has engaged Macquarie Capital to advise the company as it explores strategic partnership opportunities. 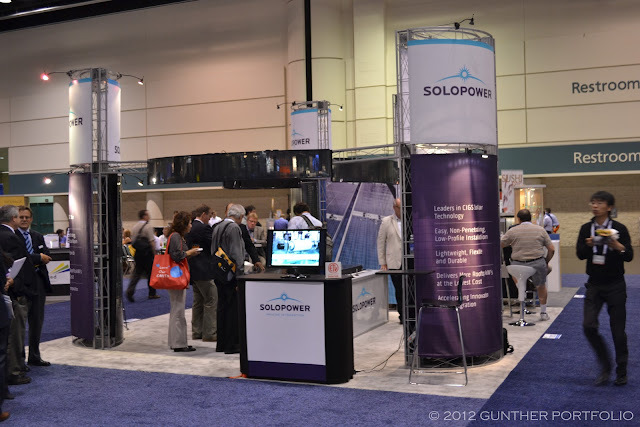 SoloPower showed the same second generation module products as Intersolar North America without any improvements in the efficiency or power output ranges of the respective datasheets. I just noticed SoloPower, the self proclaimed leader in high-efficiency, thin-film solar modules based on CIGS (copper indium gallium diselenide) only offers a “5-year limited warranty against defective materials and workmanship” while the PV industry standard is 10 years. SoloPower will inaugurate production at their Portland, Oregon USA, factory today. Ucilia Wang covers the details in “Solar startup SoloPower aims to do what Solyndra couldn’t” at GigaOM Cleantech. 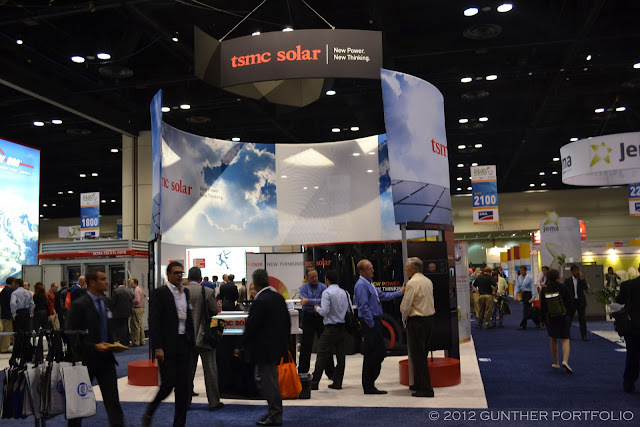 “TSMC Solar Achieves 14.2% Efficient CIGS Module” in advance of SPI12, and I heard the black modules with matching black aluminum frame are selling well to residential installations for aesthetic reasons in the surprise PV market of Denmark. Hours before “Trina Solar Streamlines its Operations”, I had a chance to chat with Mark Mendenhall, President of Trina Solar Americas. Revisiting Trinasmart DC, the 225 to 245 Wp (Watt-peak) Trina TSM-PA05 module integrated with the Tigo Energy, Inc. Maximizer MMJ-ES DC optimizer is on track for initial US shipments in 4Q12. 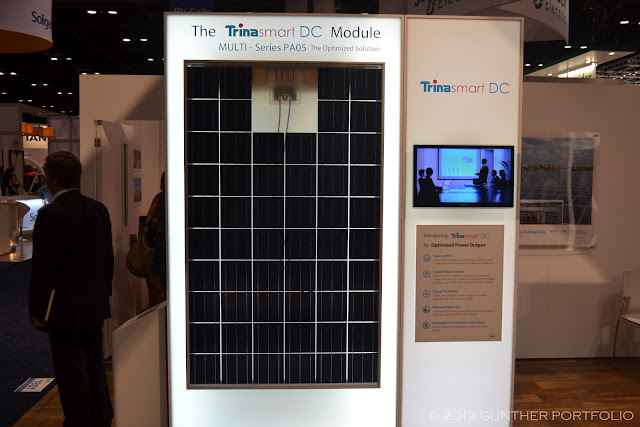 Trina will integrate Enphase microinverters for Trinasmart AC module solutions. Although I forgot to get a photo, Trina had a prototype glass-glass multicrystalline silicon solar module on display at their stand. I was told the double glass modules are lighter and scale better in large installations by reducing racking costs. Trina is finalizing the market specifications before moving the module into production. I’ve heard from a variety of sources about frameless modules leveraging thin 3 mm (millimeter) glass in the past month, and I think these may nullify most of the advantages of flexible solutions in rooftop applications. 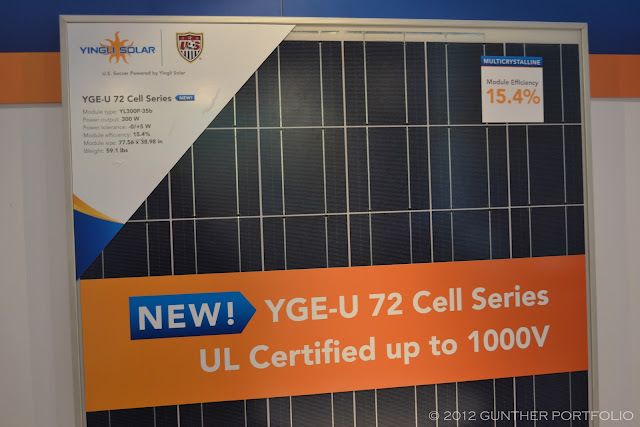 In a sign of the solar trade war times, Yingli launched the “YGE-U 72 Cell Series Reduces Balance-of-System Costs and Improves System Performance in Utility-Scale Projects”. The UL certified 1000 volt utility scale modules are presumably available with non-Chinese solar cells to avoid US antidumping tariffs since the preliminary determination has not been finalized. Have solar trade uncertainties and oversupply killed PV innovation in the near to medium term? “Is Yingli’s “Panda” on Endangered List?” by Pierce Lee at Solar PV Investor analyzes Yingli’s statements on Panda cell capacity, production, and probable de-emphasis in the declining module pricing environment. The YGE Global Investor Day 2012 Presentation provides an update on Panda technology but does not discuss Panda capacity or module shipments to date. Panda cells are said to have an average efficiency of 19.2% in commercial production and “Simple processing steps and compatible with existing p-type Si cell production lines”. President Bill Clinton’s keynote address at Solar Power International was far and away the highlight of the Orlando gathering. Interest in President Clinton’s speech and subsequent dialog with Solar Energy Industries Association (SEIA) President and CEO Rhone Resch extends across the pond to Europe. The 27th European Photovoltaic Solar Energy Conference and Exhibition (EU PVSEC) Conference General Chairman Dr. Stefan Nowak, also Chairman of IEA PVPS (International Energy Agency, Photovoltaic Power Systems Programme), lamented about the inability to obtain a transcript of President Clinton’s keynote during the Conference Opening session.